While it won’t show up for everybody just yet, some people are beginning to see a new option for Amazon Prime subscriptions. Instead of the long-running annual fee option, it will now be possible to subscribe to the service for just $7.99 per month. This might be a premium when you compare the annual total to the more expensive initial investment, but it will be a huge factor in increasing adoption this holiday season. There has been no official release from Amazon confirming the details about this new subscription plan. Even seeing the advertisement for it seems to be difficult for some people, though logging out of your Amazon.com account and trying a variety of browsers tends to eventually result in a productive combination. It is possible that we’re looking at a limited test phase as the company gets ready for a rush of Kindle Fire HD users over the holidays that the company needs to hook on the service as quickly as possible. Starting…well, whenever this goes more public…the monthly option will put pressure on competing video services like Netflix and Hulu. While Amazon Prime still lacks the depth of selection that the competing services have available it is still building up a huge library of subscriber-friendly media. Tie this into the other benefits like the Kindle Owner’s Lending Library and the unlimited free two-day shipping to anywhere in the US and it’s a huge bargain that video-only services can’t equal. So far we haven’t heard from anybody outside the US who has been able to view the ad that gives us the current pricing. This could mean that it’s going to be a later rollout or it could mean that the offer will start out as exclusive to the US. The monthly option does seem to be built as an imitation of Netflix’s pricing scheme and as such might not be considered appropriate in markets where the Prime video selection isn’t as robust yet. Expect to hear about huge increases in subscription sales in the first quarter of next year. The Kindle Fire HD is the top Android tablet in its size/price bracket and comes with a free month of Amazon Prime membership. The formerly daunting $79 subscription fee that comes up after that free trial ends was definitely worth it for anybody who shops the site regularly, but the $7.99 monthly fee will be even harder to argue against. It might be almost $17 more per year than the annual option, but if you buy at least two things per month from Amazon the math becomes quite easy to follow based on shipping savings alone. Since just before the official announcement of the Kindle Fire, and clearly in preparation for the anticipated release, Amazon has been making efforts to beef up their Amazon Instant Video selection. Many of these new acquisitions have even been made part of the Prime Instant Videos library, which allows customers subscribing annually to the Amazon Prime service to stream available content to any compatible device whenever they want with no additional purchase necessary. More than anything, this is the reason that new Kindle Fire owners find themselves enjoying a month of free Amazon Prime membership. It works well to get potential subscribers hooked. More and more, however, people have been viewing the ever-expanding collection of titles as a direct assault on Netflix. As the most popular video streaming service on the internet today, Netflix caters to over 24 million subscribers and accounted for about a third of all internet bandwidth being used as of last fall. They have had some issues recently after mishandling the publicizing of rate hikes necessitated by expiring streaming rights deals as well as a poorly thought out attempt to split the company into two separate entities specializing in only one aspect of the physical media and digital video combination that customers have come to expect, but subscriptions have since rebounded and there is little sign that they are in immediate danger. When Netflix CEO Reed Hastings mentioned in a letter to shareholders that he is expecting Amazon to start breaking the Instant Video service away from Amazon Prime in favor of a monthly model more analogous to what Netflix is known for, it was finally enough to elicit comment from Amazon. Brad Beale, the Head of Video Acquisition for Amazon, made clear in a recent interview that it is not the intent of the company to change the way they’re handling things in the near future. He seems to have avoided implying that this was something that would never happen, but at least for the moment Netflix is safe. The logic behind the decision is sound. Amazon Prime is already less expensive than even the cheapest Netflix subscription. The video content you get with it is not nearly as extensive at this point as what Netflix offers, but nobody claims that it is. By subscribing to Amazon’s service though, even if your goal is just to take advantage of the Kindle Fire’s integration with Amazon services, customers also get free 2-day shipping on anything Amazon sells. The video streaming might not be the biggest money maker in the world, but the associated shipping benefit has a tendency to make impulse purchasing far more appealing. This translates into more regular profits as well as customer loyalty. Compared to that, it is hard to imagine a huge desire on Amazon’s part to start attacking Netflix on their own terms. For the moment, at least, video distribution appears to remain a relatively small part of the company. The Kindle Fire is obviously meant to change that and it does a good job of showing off the content, but the day when physical goods are less important to the company than digital sales has yet to arrive. At this point we know that the Kindle as a physical purchase is not where Amazon is looking to make their money. If anything, the fact that they have gone to ad support indicates that there has been a need to get inventive to further reduce prices while not actually losing money on every sale. Knowing this, we have to assume that the big focus will always be on selling the most content. 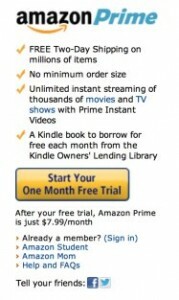 With an emphasis on renting, lending, and sharing eBooks lately, though, is this a genuinely achievable goal? Right now we are hearing about the fact that Overdrive will soon be bringing Kindle compatible library books. Definitely a selling point for Amazon, since up until now it has been a major complaint against the platform. We also now have textbook rentals that can save renters as much as 80% over the purchase price of the book. Between the two options, I’m seeing a theme forming and looking to other media rental business models that seem like they have a real chance of finding their way to the Kindle. The obvious one would be the Audible.com approach. Get users to subscribe for a monthly fee, perhaps as a means of getting a cheaper or free eReader, which locks them into picking out a certain number of eBooks to add to their library on a regular basis. Amazon has experience with this one and it would certainly work as a way to reduce eReader prices even beyond what the Kindle w/ Special Offers has been able to do. I don’t think it will happen, though. For something like this to work, Amazon would have to be able to provide value to subscribers beyond what they have control over with the current Agency Model pricing. Lack of control means lack of options. More likely, to me at least, is the Netflix model. Picture spending $10 per month to access as many books as you want, so long as you only have one checked out at a time. There would have to be some sort of artificially produced swap delay, of course, since otherwise subscribers could simply jump back and forth at will, but if the system only allowed a book to be checked out once per month or only allowed one change per day (which doesn’t seem unreasonable since the Kindle Store already generally provides sample chapters and this would only be for reading entire books) then it would work. The profit would be available since most everybody has periods where their reading tapers off in spite of best intentions, and one would have to assume that an arrangement for multiple-use licenses would still be cheaper overall than per-user purchases. If something like this could be managed in spite of the total control that publishers want over their distribution, it would be the next big thing for the Kindle. Admittedly, it is something of a divergence since reading has always had a certain element of collection attached to it for many people, but I think the opportunity to save the money would make all the difference. New York Times has recently announced that it is raising the price for Kindle subscriptions from $13.99 to $19.99 – a rise of whopping 43 percent. There is some respite for current Kindle subscribers, who will continue to be billed at $13.99 for the next six months. The Kindle edition of New York Times app has been very popular and allows readers to get news coverage of exceptional depth and breadth, as well as opinion that is thoughtful and stimulating. The timing of this announcement is very interesting and coincides with the launch of Apple iPad in United States. In a related move, an iPad application for New York Times hit the iTunes App Store yesterday. The current NYT iPad app is free and offers a limited selection of automatically updated news, features, videos, etc. laid out with a newspapery feel and offline reading capability; it’s sponsored exclusively at launch by Chase Sapphire. It is expected that a full-fledged paid NYT app for iPad would be launched soon. The New York Times subscription on the nook is also going up from $13.99 to $19.99. Like with the Kindle, existing nook subscribers will get 6 months at the old price. Many print media veterans have argued that digital subscriptions should be less than their analog counterparts, however the prices for digital editions continue to rise. I wonder if the Kindle vs. iPad battle will help the customers or will it further aggravate this pricing war?